Data loss is often an incredibly stressful situation, no matter how it happens. Whether you bent a flash drive that had your documents, dropped an external drive containing your family photos, or the server with your business’ entire financial records just went kaput, you might not know what to do or who to turn to for help. Few people known about data recovery services until they need them, and searching for a data recovery lab can feel overwhelming. Fortunately, at Gillware Data Recovery, the world-class data recovery lab in Madison, Wisconsin, we work hard to make our data recovery process as friendly and painless as possible. Whether you’ve lost data from a microSD card, thumb drive, mobile phone, hard drive, SSD, or RAID server, the specialists at Gillware are here to assist you. Start the first step in the data recovery process by clicking on one of the links below. You will be reunited with your data before you know it! Every data recovery case that we receive follows the same financially risk-free data recovery process. We provide free inbound shipping for all clients in the continental United States, and charge no upfront fees for any part of our services. Our data recovery prices are relatively affordable. On average, our rates are 40-50% lower than other high quality labs of similar stature in the industry. We charge no fees for cancellations if the projected bill is too high or unsuccessful recoveries. 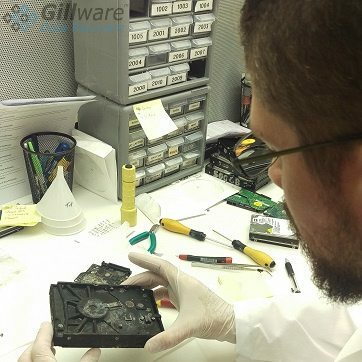 Gillware’s world-class data recovery experts, with thousands of hours of experience apiece(some individual engineers have over 20,000 hours), have successfully solved over 80,000 data recovery cases since 2004. Our specialists include experts in hard drive repair, RAID data recovery, and flash memory recovery. We understand how stressful data loss can be, so we consider it important that you can talk to real recovery client advisers while submitting your case and get updates from real customer service representatives every step of the way. Our process is designed to get you your data back or you don't pay for our service. Let's start. Call our toll-free number to speak with one of our data recovery client advisers. Our advisers will happily lend an ear to your data recovery woes, answer any questions you may have about our services, and set up a case for you in our system. Our advisers will send you an email with a link allowing you to review the details of your case, agree to our terms and services, and print out your free inbound UPS shipping label. Submit your case using our online case submission form. One of our recovery client advisers will get in touch with you as soon as possible to discuss your data recovery needs and answer any questions you may have. Gillware Data Recovery offers free inbound shipping for any data recovery client in the continental United States (the 48 states excluding Alaska and Hawaii). Upon completing your data recovery service form, you can generate and print out a prepaid UPS shipping label. The label will last up to six months before expiring, in case you cannot send your device in immediately. If you’re concerned about packaging your device properly, Gillware can also send you a welcome package at no extra cost. We send out a Gillware-marked box filled with all of the packing supplies you will need, a return shipping label, and a printed version of our terms and conditions you can sign in lieu of completing our online form if you have difficulty accessing a computer after a hard drive failure. Our data recovery experts begin evaluating your device after it is received by our shipping department. We contact our clients as soon as their devices arrive to let them know that this step in the data recovery process has begun. In the evaluation phase, our data recovery engineers carefully examine your failed storage device. We determine the cause of its failure, what kind of work has to go into recovering your data, and how likely we are to succeed. On average, this phase of the data recovery process takes about one to two business days for our standard service clients. Clients with urgent data recovery needs can make use of our emergency data recovery services for faster turnaround times. Once we finish our free evaluation of your failed storage device, we move onto the next phase of the data recovery process and send you our statement of work. In the statement, we give you our firm price quote for your failed device, along with our expected chances of success and our estimated turnaround time. These factors can all vary depending on what our engineers discover about your data loss situation during our evaluation. Our engineers use the statement of work to define the goals of your data recovery case. Ultimately, you help us define what you need to get out of our recovery efforts. We work with you to lay out exactly what type of data is most important (e.g. photos, documents, music, financial records, email archives, specific databases, etc.). We use these goals to lay out what a successful data recovery case will look like in your statement of work. In other words, you have a voice in defining what successful means for this specific data recovery case. Upon approval of the price quote in the statement of work, your device goes back to our data recovery technicians so the hard work of data recovery can begin. If you do not approve of the quote, you have the choice of allowing us to securely dispose of your device (for free) or having us ship the device back to you (for only the cost of UPS ground shipping). Upon approval of the statement of work, your failed storage device will go to the proper data recovery specialist for recovery work. Failed hard disk drives go to our cleanroom hard drive repairtechnicians. Broken flash drives and mobile phones go to our electrical engineers. Flash devices with NAND flash memory issues go to our flash device recovery experts. In cases where files are deleted, a device gets reformatted, or filesystem metadata becomes corrupted, our logical data recovery experts step in. Servers and RAID arrays go to our RAID data recovery specialists. Gillware’s world-class data recovery lab has experts for just about every kind of storage device and every kind of failure. Our specialists work together to create a well-oiled data recovery machine. On average (including evaluation time), standard service cases spend four to eight business days in our lab before the data heads out to our client. With our special expedited data recovery options, the turnaround time can be decreased to as little as one to two business days. In the next phase of the data recovery process, our data recovery technicians carefully examine the results of our work. We look through the recovered data to make sure the client’s critical data has been recovered as successfully as possible. This involves sniffing for any kind of corruption among the user’s critical data and making sure that files such as SQL databases, Quickbooks and Outlook files, or virtual hard disks function as properly as possible. We consider the case a success if the goals set by our client in the statement of work have been unequivocally met. In situations where our engineers successfully recover the vast majority of user data from a device without any significant loss of data (say, for example, 99% of files and 100% of user-defined goals met), we immediately charge the client for our work and send their data back to them in an expedited fashion. In dicier situations where a full recovery is not possible or our engineers testify that the most important data has not been recovered, we consult with our clients to judge the success of the case. One of our engineers will schedule a remote session with the customer so they can get a better idea of the data we could and could not get. Ultimately, it is entirely up to the client to judge whether or not the recovery is enough of a success to warrant purchasing the data in these situations where some of the core objectives were not met. Even if the goal was defined as “Gillware must recover 95% of my family photos” and we recovered 94%, the client is not obligated to pay for the recovery (even though most will, of course, choose to do so). If the client decides that not enough of their critical data has been successfully recovered to warrant the purchase price, they owe us nothing. We charge no fees for unsuccessful recovery attempts. When approving the Statement of Work, you can choose several options for when we return your data to you. You can choose the capacity of hard drive you wish to purchase from us to store your data, or tell us that you want to supply one of your own. You can also choose how the drive will be formatted (NTFS for Windows, HFS+ for Mac, or exFAT for both Windows and Mac). At this point, you also have the option of choosing the shipping method for your recovered data. When you pay for our technicians’ data recovery efforts, we take the data we’ve recovered from your device and extract it to a new, healthy hard drive. You can either request that we use one of our encrypted Western Digital My Passport or My Book hard drives, or send in a hard drive of your own to store the recovered data. We use Western Digital My Passport and My Book hard drives due to their hardware-level full-disk encryption features. During the quality assurance process, we create a randomly-generated password to encrypt the drive and email the password to the drive’s intended recipient. This ensures that your recovered data cannot be intercepted if something happens to the drive on its way to you (or if the wrong person picks it up). Once the new hard drive has gone through our QA process, we package it with plenty of padding and cushioning and send it out to you. We ship our packages through UPS, unless a client requests otherwise. After all is said and done and your case has been closed out in our system, there’s still one thing we still must do. In the interest of security, we must get rid of all of the data we’ve recovered from your failed device. The hard drives we store client data on run through what we call our hard drive “sanitizer”. The sanitizer goes through each hard drive put into it and writes zeroes to every one of its sectors. After several passes, all data has been completely and irrevocably erased from the drive, freeing up the drive for reuse and keeping your data secure. We sanitize the drive containing a client’s data five business days after the scheduled day they receive their recovered data. This gives the client a week to make absolutely sure they’ve gotten what they paid for and that nothing went wrong with the extraction or with their new hard drive. Upon the client’s request and for a monthly fee, we can securely hold their data indefinitely in our facility for archival reasons. After a successful data recovery case, one of two things can happen to the client’s original storage device. The client can either request the device sent back to them, or give us the go-ahead to properly dispose of it. If they never specify their equipment will get professionally recycled in an eco-friendly way at a future date. Why Choose Gillware Data Recovery? Gillware’s data recovery services are affordably priced, technologically innovative and completely secure. Gillware is proud to be a recommended provider for Dell, Western Digital and other major hardware and software vendors. These partnerships allow us to gain unique insight into recovering from these devices. Using advanced engineering techniques, we can recover data from large capacity, enterprise grade storage devices such as RAID arrays, network attached storage (NAS) devices and storage area network (SAN) devices. Thanks to special engineering and programming efforts, Gillware is able to recover data from virtualized environments with a high degree of success. Gillware has been security audited to ensure data safety, meaning all our facilities, networks, policies and practices have been independently reviewed and determined as completely secure. Gillware’s facilities meet the SOC 2 Type II audit requirements for security to prevent entry by unauthorized personnel. All staff are pre-screened, background checked and fully instructed in the security protocol of the company. Our entire data recovery process can be handled to meet HIPAA requirements for encryption, transfer and protection of e-PHI. No obligation, no up-front fees, free inbound shipping and no-cost evaluations. Gillware’s data recovery process is 100% financially risk free. We only charge if the data you want is successfully recovered. Our pricing is 40-50% less than our competition. By using cutting edge engineering techniques, we are able to control costs and keep data recovery prices low. By providing us with some basic information about your case, we can give you an idea of how much it will cost before you proceed with the recovery. We only charge for successful data recovery efforts. We work with you to define clear data recovery goals for our technicians, and only charge you upon successfully meeting these goals and recovering the data that is most important to you. Gillware has the seal of approval from a number of different independent review organizations, including SOC 2 Type II audit status, so our customers can be sure they’re getting the best data recovery service possible. Gillware is a proud member of IDEMA and the Apple Consultants Network.